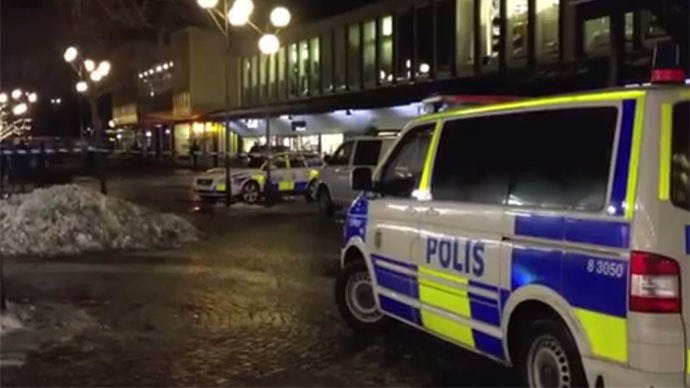 At least two people have been killed and eight others injured after two gunmen reportedly armed with Kalashnikov rifles stormed a bar in Gothenburg, Sweden, shooting people at random as they were watching a football match. Eight people injured during the assault were taken to a local hospital, Sweden's SVT Reports.At least two people have reportedly died and police fear the death toll could rise. According to witnesses the shooting began after two men armed with Kalashnikov semi-automatic rifles entered Var Krog Och Bar. “We sat and watched the game when the shooters came in,” said one witness. “I didn't have a chance to think about what happened. Then I saw that my friend was bleeding. I tried to stop the bleeding as good as I could with my hand,” said another witness according to AP. The suspects are still at large, and police said that the crime appeared to be gang-related. One eyewitness confirmed reports of gang-related activity, saying “it is the gangs that are doing these sort of things around here,” according to Britain's Daily Express. “There is absolutely nothing that indicates terrorism,” emphasized police spokeswoman Ulla Brehm. Authorities also confirmed reports that an automatic weapon was used in the attack. Police say that the first emergency call was received at 22:23 local time. Ten ambulances and several police units were sent to the site of the incident immediately. The crime scene remains cordoned off as police conduct their investigation. No one has yet been arrested, but police are questioning possible witnesses.